The threat landscape is continually evolving. While hackers are busy developing new techniques to breach enterprise networks by compromising workstations, phishing schemes remain one of the top ways to lure employees into social engineering attacks. 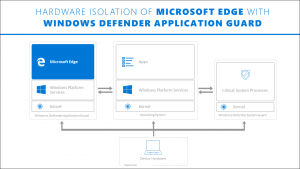 Windows Defender Application Guard (Application Guard) is designed to help prevent old, and newly emerging attacks, to help keep employees productive. Using our unique hardware isolation approach, our goal is to destroy the playbook that attackers use by rendering current attack methods obsolete.